Building on the successful launch of the Registered Traveller service in 2015, we were asked to resurrect a previous pilot that allowed UK citizens join the US Global Entry service. Global Entry is the US equivalent to Registered Traveller, providing automated entry through immigration and customs. Anyone that travels to the US regularly is likely to benefit as they will save time each time they arrive there. To be eligible for Global Entry membership the US government requires an applicant to first undergo criminality checks in their home country. A previous pilot for UK citizens ran in 2010 and after filling out a form and having some background checks done the applicant would then need to visit a police station and get a paper certificate at a cost of £50. This process wasn’t developed around users, however, and just aimed to fit into existing processes. It could take weeks to complete and required a fair amount of effort from the applicant. For the UK government it was also inefficient and costly to administer. Because of this the pilot was never sustainable and had to close with just 2000 users. When the Registered Traveller team were asked to take this work in November 2014 and deliver it using a digital approach we had to look at the processes again from scratch. We were also tasked with delivering the service quickly – within 12 months. It couldn’t be overly complicated or costly and had to fit around much of the existing technology of both the US and UK governments. The lessons we’d learned building the Registered Traveller service were invaluable. Actually having the online Registered Traveller application form built around well-researched user needs was a solid starting point. The ‘back end’ Registered Traveller caseworking system, which manages data and performs checks in an automated way, also served as a key building block for the new service, as we were able to reuse much of the digital environments and infrastructure that were already in place. Most importantly, we now had a strong digital capability available, with a proven track record ready to launch into delivering another new and exciting service. This included a skilled user research and design team and expert in-house web developers. As with most services, what the customer sees and uses is the most visible element of the Global Entry project. The user research, design and content work quite rightly gets much credit for explaining a user journey, which involves filling out two online forms on different websites and interacting with two different governments. But there also has to be some clever stuff behind the scenes, and this is where the technical team came into their own. A separate blog will explain in more detail, but in short, the team built an integration system allowing our existing Registered Traveller caseworking systems to talk and share information with their equivalent US systems. This is no small achievement for a wide variety of reasons. Using our digital expertise, however, this has been done in months and in a low cost and effective way. 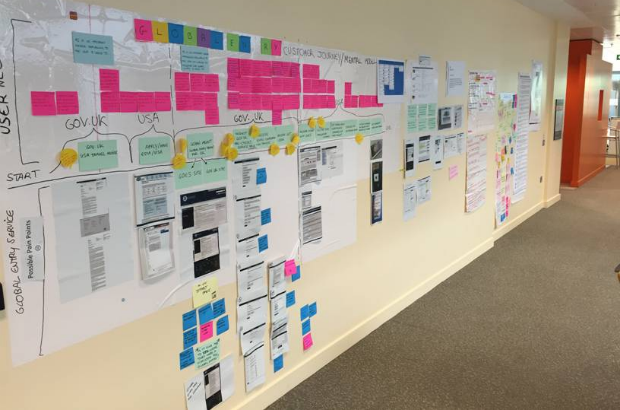 Without our agile digital approach, this would have taken years and cost far more. It was kept simple, and was delivered as a ‘minimum viable product’, which importantly works, with real users already able to complete the whole process online. The new service is called ‘Register to apply for US Global Entry’. It is in a private Beta stage during November 2015, meaning it is only open to a small group of users and is still being tested. We’re controlling user volumes through the use of ‘invitation codes’, which are being sent out to selected end users with the help of commercial partners. Once we’re happy the system is working well we aim to open up the service to everyone in December. We charge £42 for the UK checks, which includes our ongoing costs of managing the data for the 5 years that Global Entry membership lasts. There isn’t a piece of paper in sight and feedback from the extensive testing we’ve conducted with potential users and those who took part in the previous pilot has been extremely positive. While the new service is not perfect – ideally we would have just one online application form for both the UK and US sides of the process – we will be improving it continuously and have made an important first step. And while other countries, like Germany and South Korea, are also set up for their citizens to join Global Entry, they all still operate manual processes and checks, much like we used in the original pilot. We are the only country that has created an automated integration service, capable of handling large volumes of applications. The way our systems can now communicate with the US mean that an applicant can complete the UK part fully digitally, generally receiving a response in less than 5 working days. Our equivalents at US Customs and Border Protection are keen to learn more about our approach and how we put users at the centre of our development. There’s also been interest from the Canadian government, with who we’ve been discussing the potential to link in with their ‘Nexus’ frequent traveller programme. As well as improving upon the Register to apply for Global Entry service, our work is also benefiting other projects. We’ll be reusing large parts of the Registered Traveller systems again to deliver a much-improved electronic visa waiver service for citizens from the Gulf states in the coming months. So from first going ‘live’ with Registered Traveller at the start of 2015, two further new services will also be in operation within 12 months of this launch. They are just part of digital transformation work that Home Office Digital is spearheading.